Christmas with its presents, Easter with its egg hunts, Halloween with its trick-or-treating candy, your birthday and the Fourth of July (fireworks) were the biggies when I was a kid. Sure, there were religious and patriotic overtones to the holidays, but, be honest, what did YOU think of? One year Dad ordered a huge box of fireworks through the mail. When it arrived – and I mean a HUGE box – we all gathered around and unpacked it piece by loving piece. We were admonished NOT to pull on the fuses or they might not work. We weren’t allowed to open any of the individual packages and we certainly weren’t allowed to jump the gun and actually light anything early. I don’t recall exactly what was in there. I’m sure it had cone-shaped fireworks, all kinds of rockets, Roman candles, bottle rockets and fire crackers from the lady fingers all the way up to the two-inchers. For the little kids, it had carbon snakes and sparklers. It might even have had the mighty cherry bombs and M-80s. Our big thing was to see how far we could launch cans. The small cans that frozen lemonade came in were perfect for the smaller crackers. We quickly learned that the M-80s and cherry bombs wouldn’t send the can in the air. It would blow them up on the launch pad. To keep from burning up a gazillion matches, the fireworks stands would give you cork-covered sticks – punks- to light the fuses. 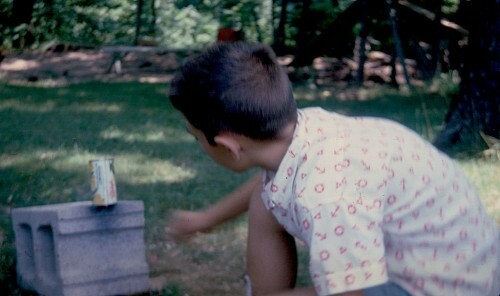 Shooting cans in the air and lighting firecrackers one at a time was fun, but quickly became boring. The next step was to twist together the fuses of half a dozen firecrackers so you could try to get them to all go off at the same time “like a stick of dynamite.” Of course, that never happened. the first one to go off would cause the others to scatter or it would blow out the other fuses. Dad considered it bad form to light whole strings of firecrackers. Until, of course, even HE got bored playing with them. He usually suspended them from a tree branch so they’d writhe, pop and flash in the air. This was particularly good at night. I don’t know how many times I heard him grouse, “Six days of the week I sit on the ground chewing sandwiches full of sand. 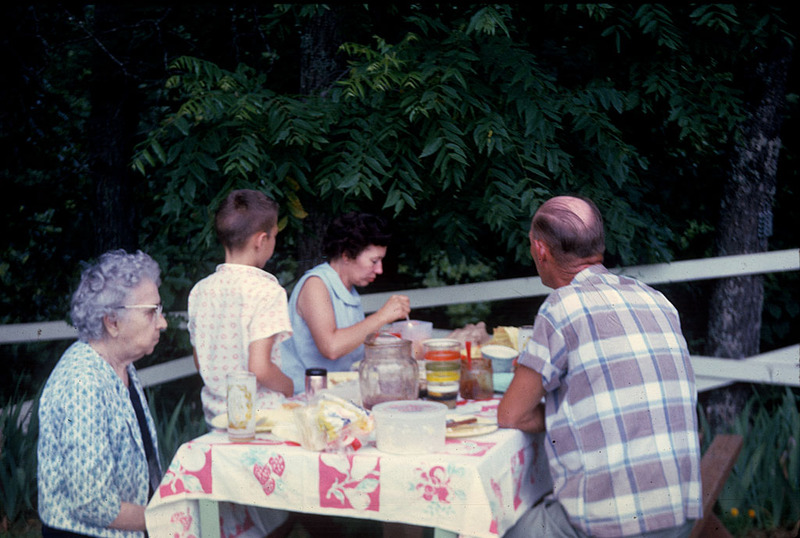 I don’t plan to do that on Sunday.” I guess the 4th didn’t fall on a Sunday, so my grandmother, Mother, Brother David and Dad are gathered around the table in our backyard. When we lived over on Bloomfield road, Dad got half of the instructions right. The “light fuse and get away” part he understood. He didn’t bother to read the section that said, “If the firework doesn’t go off immediately, do NOT lean over it to see why.” One of those cone fireworks came to life when he was checking it, causing us to hold off lighting the rest of the fireworks until he returned from the emergency room. I don’t remember what the exact nature of the injury was, but he never shot off that particular type of firework again. The date stamp on the front of the print says JUL 1960, so I must have shot this with my trusty Kodak Tourist II folding camera set on Time Exposure. I’ve got some shots filed somewhere where my brothers spelled real words in the air. I didn’t bother: my handwriting looks like this ALL of the time. Wife Lila captured Son Matt and Grandson Malcolm shooting off fireworks in 2008, when Malcolm was four. He’s not exactly sure how he feels about the noise. If you’re in a drought area (I’m talking to you Florida and Texas), don’t be shooting off fireworks. The house you save might be mine. As a kid, going to the fireworks stand and seeing all the fireworks was a cultural experience in itself. Chinese fireworks with their colorful packaging, exotic graphics and promises of “fantastic light show” was better than any candy display. The plywood tables under a “circus” tent with all those fireworks from edge to edge was overwhelming to look at and gazing at them while thinking of the possibilities of what they could do once you put the tip of a smoking punk to them was wonderful. Black Cat firecrackers were the ones of choice and you hoped there was a buy-one-get-one-free offer when you went to purchase your paper bag of fireworks. When you were old enough to be handed a lighted punk and told the simple rules of lighting things full of gunpowder and tightly rolled paper you had arrived and the world was yours…to blow up. I remember in the 50s, watching fireworks at the Arena Park while sitting in the grandstands with my Grandparents. I was fairly small at the time and enjoyed the colors but held my hands over my ears on the ones with the loud reports. I don’t remember if they were shot during the 4th of July or during the SEMO Fair. Awesome! 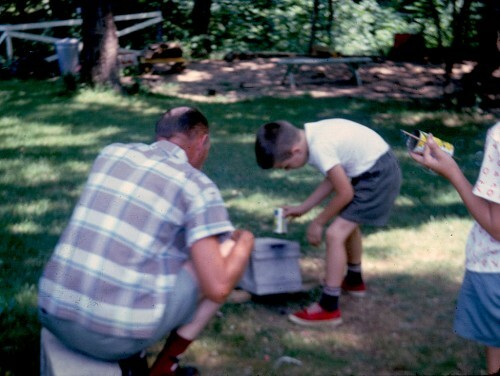 Back in the 1950s my cousins and I would get together on the Fourth to shoot off our fireworks. To get more bang for our bucks, we would add a few drops of gasoline to the fireworks soon to be discharged. The effect was amazing!! With increasing amounts of gasoline, we could achieve much higher levels of bang!! My aunt found out what we were doing and put the kibosh on our activities before we blew ourselves and the neighborhood up in one giant fireball!! 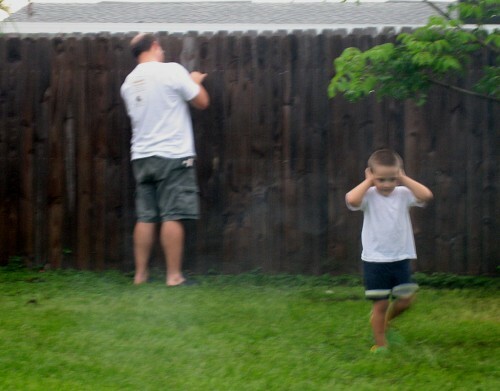 To this day, I still think and chuckle about that Fourth of July, and wonder what my reaction would have been if I found my kids (four boys) doing the same thing. They did, only they made sure I was not around to catch them at it!! Occasionally we would do our 4th of July on a gravel bar on a river, like Castor River, where we could swim during the day and shoot off some fire works when it got dark. Usually several families would go together. It was a great day for the kids. I wish we had taken some pictures. My older brother moved to Kansas in the 50s and came home on one of the 4th of Julys one year. He brought a bag full on M80s and cherry bombs which were hard to get in Cape. We drove out to Cape Rock since it was out of the City limits at the time to shoot them off. Everything was going quite well until a spark went into the bag and the whole bag went off, needless to say there was a lot of noise and quite an explosion. The people nearby were heard to say “those people are crazy” and left in a hurry. It was very funny after the fact and still brings good memories of the 4th. I also remember getting 22 shells, try being a 7/8 year old buying them today, we would loosen the head of the shell and throw them on the sidewalk to make them go off. It was really neat when you were able to make one go off. Now I wonder just where that projectile went, lucky no one got hurt but it is still a good memory. Then one year when I was 7/8 my Uncle took me to his farm in Arkansas. It was around the 4th of July and I brought some fire crackers, Black Cats, and was shooting them off out in the field. Well I lit one and went around the corner of a ridge to get away from the noise, when I came back to see the damage the field was on fire. I tried to stomp it out with little success. Luckily a neighbor was coming down the road, saw my predicament and got my Uncle. He got an old potato sack and put the fire out. He was not to happy with me. I never thought to add a little gasoline to the fireworks; I imagine that would add a little more excitement to the explosion. The joys of being young and not having to many brain cells at our disposal, plus having older brothers and friends in the neighborhood also helps. The Country Club celebrated the Fourth in the 50’s with a golf tournament, swimming races, greased watermelon chases and a pool cooled by 100 lb blocks ice. At dusk a major fireworks display lit up the rural sky. While the folks sat out on the patio in the old steel chairs, the children romped on the practice green, the only grass green on the 9 hole course. The explosions seemed to last forever until the last year when they all went up at once. While hard to top, the single event that most will recall was a local Bon vi vant entertaining the crowd by putting a cigarette and Black Cat in his lips and lighting them both. In the stupor or excitement he tossed the wrong one. Until the fireworks display was moved from Arena Park,my parents front yard, just a block from the Park (corner of East Rodney and Rodney Vista) was a great place to enjoy the fireworks. Even in the 70s, when many of the kids were married and some had children, the Fourth still was spent at my parents. Cookout, sparklers, snakes and smoke bombs for the kid kids; adult beverages, firecrackers and bottle rockets for the adult kids; Arena Park fireworks, and watching the heavy (for Cape) traffic on East Rodney leaving the park are Independence Day memories I will always cherish. They are more precious than the memories of the Fourths spent on the St. Louis and Philadelphia riverfronts, New York harbor, or even the Mall in Washington, D. C.
Although, D. C. does come close. I grew up on Cecilia St. (across Perry Ave. from the Rose Garden). On the 4th we would sit in the middle of the street in lawn chairs and watch the fireworks at Arena Park. Not much car traffic on our street back then. We were also lucky that Gene Schwab lived at the bottom of our street. He was the son-in-law to Walker Child’s, who owned Child’s IGA. The IGA store had a fireworks stand and Gene would bring home sacks of fireworks at the end of the day (4th). We would have our own fireworks display on our street. Fond memories. 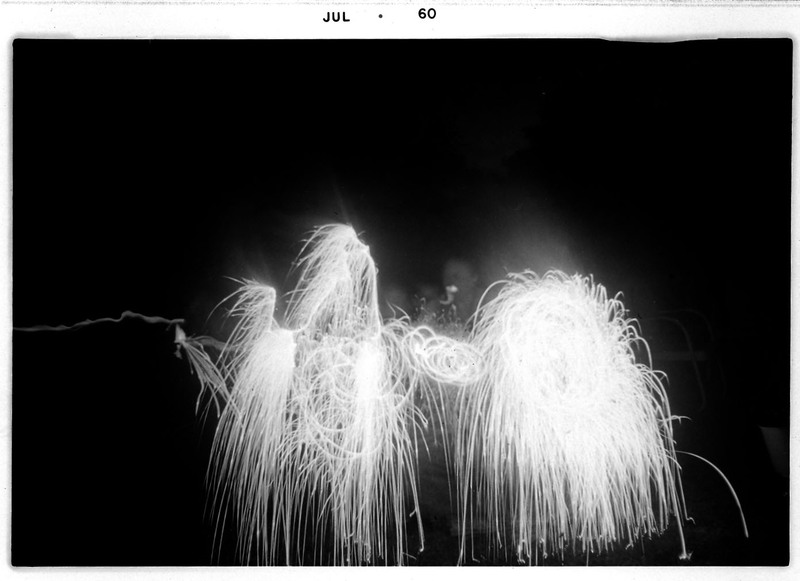 during the summer of 1966, on a trip to philmont scout ranch in new mexico (2 bus loads of scouts and leaders) we stopped at a fireworks stand at a highway rest stop in the great state of kansas. for the astonishing low price of $.05 each my fellow scouting member john rigdon purchased approximately $2.00 of M-80’s. we watched as he lit them and eased them out the slightly opened rear side window of the bus. the resulting explosion and smoke along side the trailing bus was a sight to behold. scolding was sever, but punishment was minimal at the next rest stop. one of my great memories of scouting. and those low cut red shoes (converse?) are also a sight to behold. i had chuck taylor black low cuts. happy 4th of july. Don’s family did fireworks the same way as your family did–one firework at a time. However, future engineer husband Don, even as a kid, managed to turn the 4th into a backyard arms race by nesting cans inside each other with water to increase compression, etc. As soon as the school year ended, he began collecting potential projectile material. On the other hand, I later became known as Aunt Oven Mitt when I insisted my then little nieces and nephews use oven mitts to hold sparklers! LOL! I missed this post when it first appeared somehow. The best can launch was performed by punching a hole the size of a firecracker in the bottom of a Campbell’s soup can, stuffing all but the very end of the firecracker with the fuse through that hole and inverting the soup can in a vegetable can 1/2 full of water. The soup can would launch close to 100 feet in the air. My friend, Mark Phillips, and I would scour the Arena Park grounds around the area where the fireworks were set off for unburnt remnants of the aerial shells. The small pieces would burn various colors. We would use model rocket engines and place multiple colored pieces with some additional powder in the tube above the ejection charge to make our own bottle rockets. We used to get firecrackers occasionally. One year, I got a box of cherry bombs. A friend had told me about driving a pipe in the ground at an angle. He lit a cherry bomb, dropped it in the pipe and then dropped an old D-cell battery in after it. The cherry bomb exploded and shot the battery out like a mortar so fast you never saw it come out. One time, I set one up under my mother’s clothesline and put a cardboard box directly over it. The battery blew the bottom out of the box.